B Vitamins have been known to maintain brain function by way of supporting healthy moods, stress management and energy production. Deficiencies in B Vitamins include symptoms that are observed in psychological conditions such as depression, anxiety and psychosis. B Vitamins are vital for brain health and help with the energy production that is required for neurons to work properly. B12 specifically helps to prevent atrophy of the brain. B Vitamins as a group support neurotransmitter production and function. Folate, also known as Vitamin B9, helps to lower homocysteine levels which are associated with greater risk of dementia, including Alzheimer’s disease. 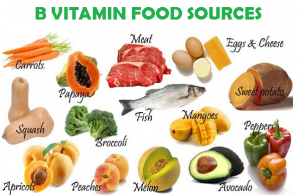 B Vitamins are water soluble vitamins that can be taken as a supplement or obtain through foods by including the following variety of foods in your daily diet: meat, fish, poultry, eggs, whole grains, green vegetables, peas, carrots, legumes and beans. Include all 3 brain boosters you’ve learned about over the last 3 weeks to keep help your brain function at its optimal and prevent it from deteriorating.